The pursuit of physical fitness for me is both an escape and a way of life. Whether running for miles on trails or charging up a hill on my bike, that's when I am my best self -- focused, powerful, and free. Living in Portland, where I don’t have to depend on a car to get around, and where active transportation is celebrated by the community, provides new inspiration. Working as part of the Alta team brings me full circle in my current life pursuits, joining my passion and beliefs with my talents. Natalie Lozano brings Alta’s mission to life through creative visioning, effective story-telling, and coaching. An expert in marketing for professional service firms, Natalie’s focus on thought leadership and communications has enabled the firm to expand in emerging markets and evolve as the market leader the active transportation. Natalie hails from Manhattan where she worked for ten years as Marketing Director for some of the most successful design firms in the city. She served for several years on the Board of Directors for the Society for Marketing Professional Services (SMPS), and was a major player in the New York City scene focused on the built environment. Now living in Portland, Oregon, and one of the owners of Alta Planning + Design, she is enthusiastic about combining her interest in active transportation and health with her business background. With a degree in architectural history and East Asian Language Studies from Rutgers University-New Brunswick, she earned recent certifications in global marketing, leadership, and financial accounting from the Thunderbird School of Global Management. Natalie’s commitment to health and active lifestyle is evidenced through her work as a certified personal trainer and strength and conditioning coach. She has been featured in fitness articles in Shape Magazine, Blue Cross Blue Shield newsletter, and Experience Life Magazine. Natalie spends her free time moving in many directions via different self-propelled modes: cycling, mountain climbing, surfing, and running. She speaks Japanese and is an active member of the Japan-American Society of Oregon. 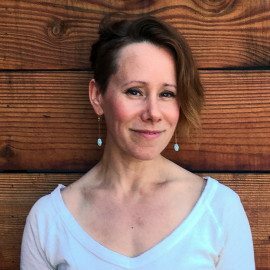 Natalie is also an Oregon State University Master Gardener, a member of the Oregon Bee Atlas project, and is committed to regenerative practices in home gardening and backyard habitat design.